“We sought to unify Chicago, and I know of no other way than through music,” says Davis. Orbert Davis Delivers Simple Message "We're more alike than we are different." Xinhau Net, June 15, Chinese folk musicians perform with Chicago Jazz Philharmonic in a concert themed on "Chicago Immigrant Stories" at Millennium Park. Splash Magazine, July 17, Orbert Davis and Chicago Jazz Philharmonic provided the perfect tribute to Nelson Mandela's legacy. World Premiere of "Hope in Action"
Chicago Tribune, July 18, Chicago Jazz Philharmonic celebrates Nelson Mandela's Centennial with a world premiere performance of "Hope in Action". Chicago Parent, August 2, Don't miss Chicago Jazz Philharmonic's kickoff of the Chicago Jazz Festival with it's Legend and Lions performance as well as a second-line march of Chicago musicians. Chicago Tribune, August 25, Ensemble covers 13 years of work with passion, skill. Chicago Tribune, August 16, Orbert Davis's CJP launching new series. Drum, May 3, D'Addario Awards six Chicago-area Music Education Grants. 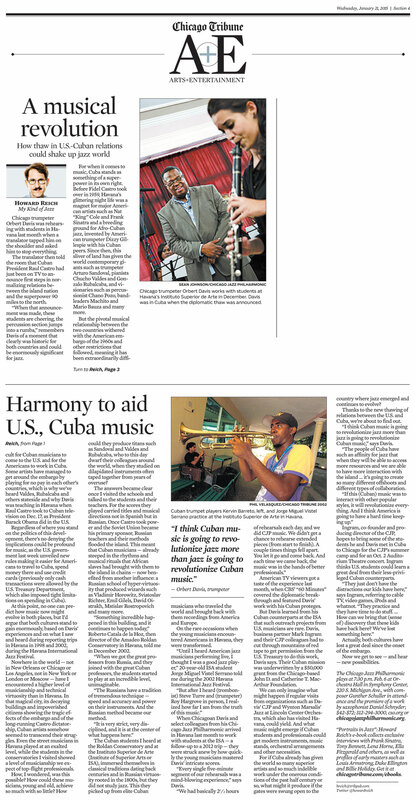 Daily Journal, April 27, Orbert Davis brings his 60-piece Chicago Jazz Philharmonic to The Center For Performing Arts at Governors State University. 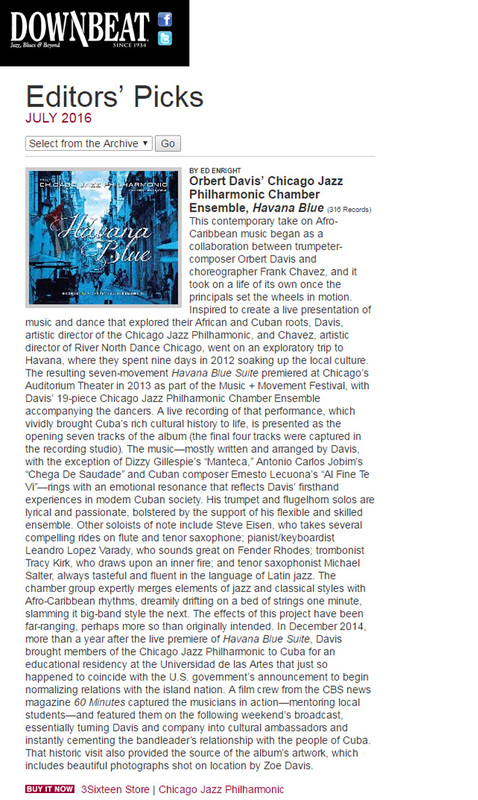 Chicago Tribune, November 14, Orbert Davis' important 'Mississippi River' rewards orchestra's journey into the unknown. Chicago Tribune, November 9, Orbert Davis explores the Mississippi River. 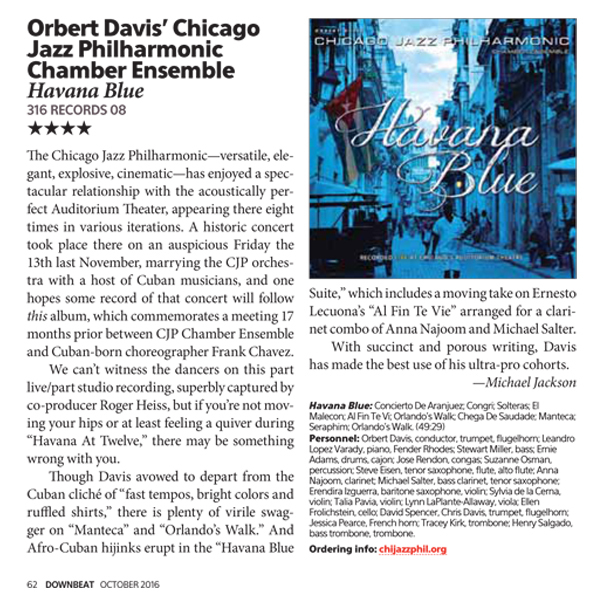 Jazzed, June 16, Orbert Davis' Chicago Jazz Philharmonic Chamber Ensemble Releases New Album 'Havana Blue'. 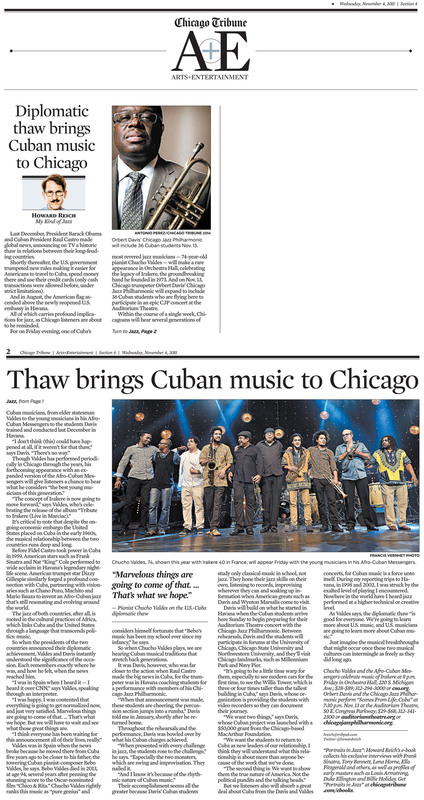 Chicago Tribune, Jan 14, A grand concert for South Shore jazz festival.